We returned to Helsinki on the train from Moscow, a trip of 14 hours. Getting out of Russia was easy, the customs check was just a formality and the paperwork simple. We turned in the second half of the form we filled out when we entered Russia. I don't know what would have happened if we had lost that little slip of paper but it would probably not have been very nice. 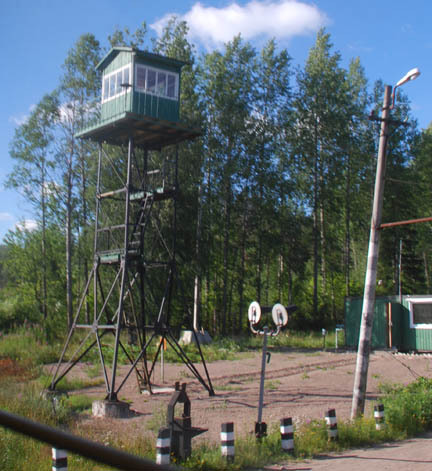 This picture is of the guard tower at the border along side the train track. We picked up the bike from our friend's garage and headed across town to the campground, our friends were at their summer house and we didn't get to say "Thanks" face to face, but we phoned them and said it. Thanks again for everything. We spent 3 nights in the campground doing laundry, resting, buying ferry tickets to Tallinn and visiting the Sea Fortress, an old fort on an island in the harbor. On Wednesday we took the ferry to Tallinn, Estonia and found the city campground. It is at a indoor sports complex and is not very good. But we are in Estonia, an old "Iron Curtain" country.